Still ill. Still stuck inside. Still miserable. (wah). Well, the only good thing that's come of moping about this weekend is having loads of free time to do useless things. 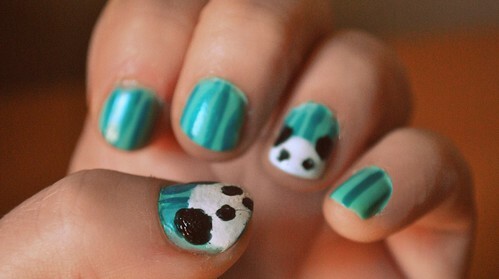 Like paint panda bears on my nails. Er. Of course. This is what they look like. These are SUPER messy, but who cares? I'm ill. They are pandas. That's all you really need to know. 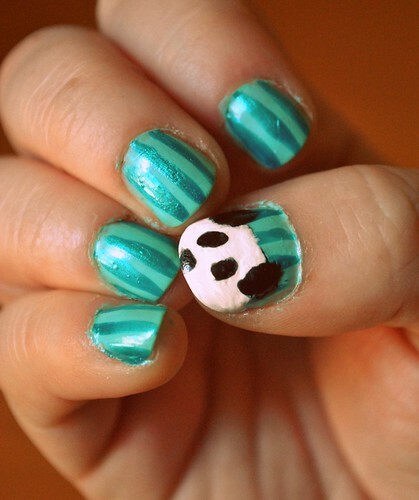 They were actually really easy to do, if you fancy joining the bear revolution - just do stripey green nails (for bamboo), splodge on some white varnish where you'd like the wee faces to sit, and use a kirby grip to do the ears and eyes. Try not to paint your entire fingers (like I've done) and that's it! I feel like such a grown up.